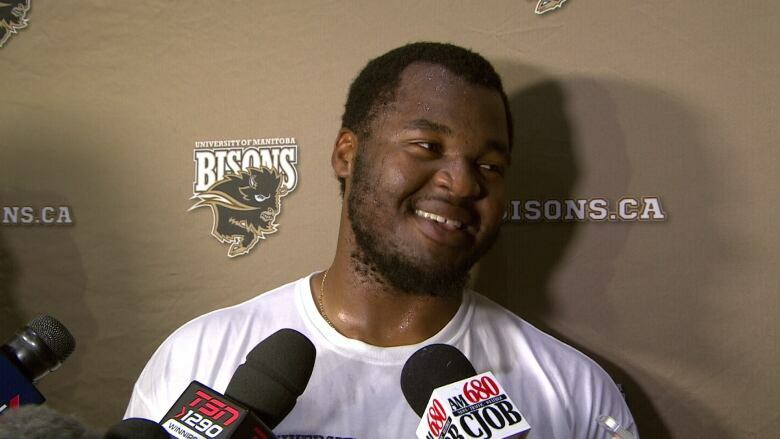 New Orleans Saints defensive tackle and former Manitoba Bison defensive lineman David Onyemata has been cited for misdemeanour possession of marijuana, says a suburban New Orleans sheriff’s department. A statement released on Thursday by the Jefferson Parish Sherriff’s office says a narcotics agent received a tip that marijuana products would be at Onyemata’s apartment in the New Orleans suburb of River Ridge. The agent secured a warrant and searched the residence on Jan. 29, finding marijuana, THC oil, edible marijuana products and hemp powder. The sheriff’s statement says the 26-year-old Onyemata co-operated with investigators and received summons. Based on NFL rules, Onyemata could receive a league-issued suspension as long as four games. Saints spokesman Doug Miller says the club is refraining from commenting at this time. Born in Nigeria, Onyemata moved to Winnipeg to attend the University of Manitoba in 2011. He was named the top down lineman in Canadian university football in 2015. Onyemata was picked in the fourth round (120th overall) by the Saints in the 2016 draft. He has played all 16 games for the Saints in all three of his seasons with the squad. Onyemata had a career-best 4½ sacks and 23 tackles for the Saints this year.